By cutting through the Manitou Passage instead of sailing up the middle of Lake Michigan, mariners were able to shave 60 miles off of their journey between Chicago and the Straits of Mackinac. In the days of wood-fired steamships, this made the Manitou Islands a prime point for ships to stop and refuel. Along that 300-mile course, the Manitous were also the only islands with a deep enough harbor to shelter larger ships. 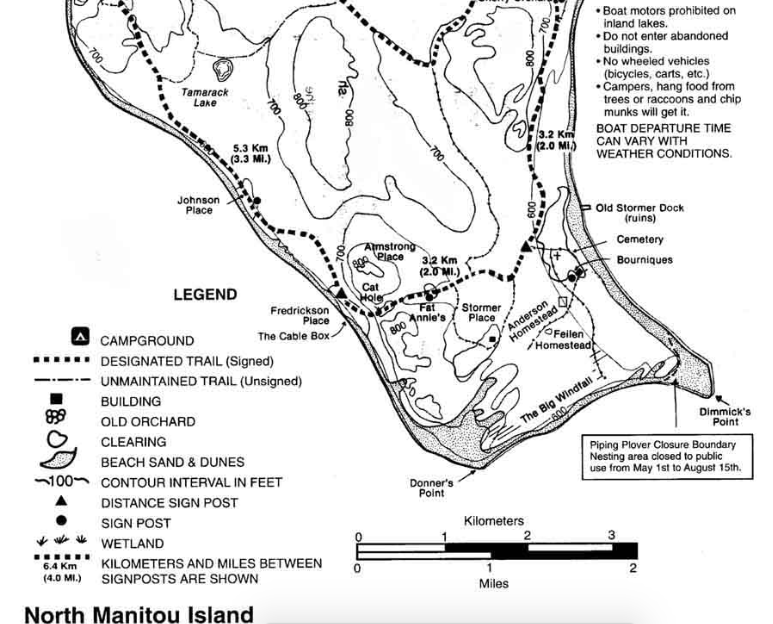 Because North Manitou does not have a natural harbor like South Manitou, the start of logging activity there came almost ten years after its southern sister. Or, that’s how long it took for them to run out of trees on South Manitou. One advantage North Manitou possessed over South Manitou however was a shoreline not as dominated by steep dune cliffs. This allowed docks to be built more easily, especially on the steeper western side, which was useful for servicing ships during strong easterly winds, or for ships that were not sturdy enough to safely navigate the Manitou Passage, and must pass to the west. 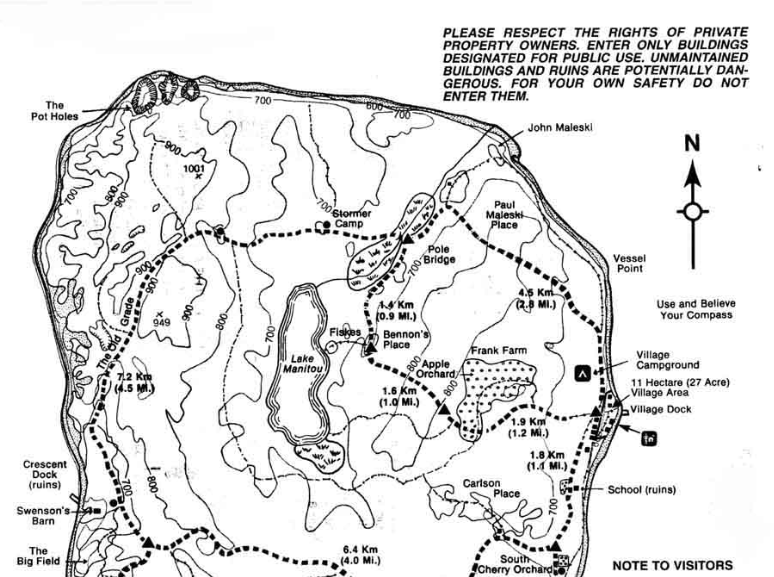 This amounted to the usual spiels about no fires allowed, stay out of the abandoned buildings, don't step on the endangered flowers, hang your food, blah blah, and that there was a minimum of four hours for any kind of medical response if you get hurt out there—assuming you can send word to the ranger station. She noted that in the event one can find a signal, 911 calls from cell phones most times get routed to Wisconsin, and then warned everyone to remember to specify that their location is in Michigan. She also adamantly drove home the directive to be back here at the ranger station one hour before the ferry arrives so that we can be accounted for. Otherwise a search party will have to be sent out. Also, the boat will leave without you. Since I didn't have a cell phone, nor any intention of getting lost, nor of staying out of abandoned structures, little of this applied to me. I was also the only one hiking out alone, which prompted the ranger to prod me in regards to my previous backpacking experience, and to see whether I was a nincompoop or not. In my studying of the island beforehand, I had learned that it was about 20 miles in circumference and was mostly flat, which meant that I could get around here fairly easily and quickly, even laden with a pack. When I was at Philmont we did up to 12 miles a day, and that was with high mountain altitudes, rugged terrain, and 100-degree heat, so I should be able to knock out a comfortable lap of this island in the two days. Nonetheless one cannot underestimate the serious nature of this business, especially when hiking out alone, as the weather can get brutal here without warning. She must have been satisfied that I was not a blithering idiot likely to need eventual rescue, and I was turned loose out into the drizzling grey. The immigrants who came here during the 1850s were driven by the problems in Europe, and most homesteaders who came to these islands were Scandinavian, Irish, or German. By 1860 there were 269 inhabitants in 50 families, and many of them were farming by this point, but 1870 the population had fallen to 91. By the 1880s farming had almost died out until a second wave of Scandinavians showed up. Part of the reason farming never did well on North Manitou is because of its sandy topsoil and the fact that the island still lacked a good harbor, which hampered the delivery of bulk supplies or the shipping of bulk crops. The logging business on the island began to tank in the 1880s as well, when ships began to use other fuels such as coal. In addition to the lighthouse at Dimmick’s Point, a Coast Guard lifesaving station was built in 1877 on the east side of the island. For 23 years, the North Manitou Lifesaving Station was the only one in the Manitou Passage, but by the 1900s there were lifesaving stations on South Manitou and at Sleeping Bear Point as well. In 1933 the government cut back all the Coast Guardsmen of the North Manitou Lifesaving Station, and only two remained there until the start of WWII, at which time the station was closed permanently. The buildings of that station mostly still remain today however, and they in fact function as the National Park Service Headquarters for the island where I had just received my “orientation." (I once explored a different lifesaving station on Lake Huron, which I covered in a different post). Immediately I came upon some of the more notable structures of the island. These were part of the “Village” marked on the map, which represent the only remaining settlement on the island, though it is only inhabited by a couple rangers (who only stay on the island a couple weeks at a time anyway). 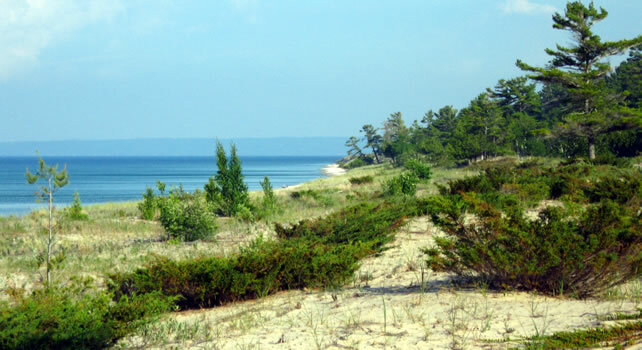 In the 1890s North Manitou became a summer resort for Chicago’s rich because everyone wanted to escape the brutal heat of urban summers, which meant heading up north, but because automobiles and roads were still primitive, boats were the way to go—and Michigan’s plentiful islands lent themselves to this use. Around 1890-94, this strip along the shore south of the lifesaving station was bought by a retired Chicago banker named Silas Boardman, and subdivided into lots. This is the area that became known as “Cottage Row.” Although all ten Cottage Row lots were sold, few cottages were ever built on them. This cottage, built for a Mrs. William Shepard of New Orleans, was to follow a similar design to their former home in Louisiana. Mrs. Shepard took in-boarders in the summer, and opened the dining room to all islanders, quickly earning it the nickname, “Shepard Hotel.” A post office was also built in this area of the Cottage Row and the lifesaving station. 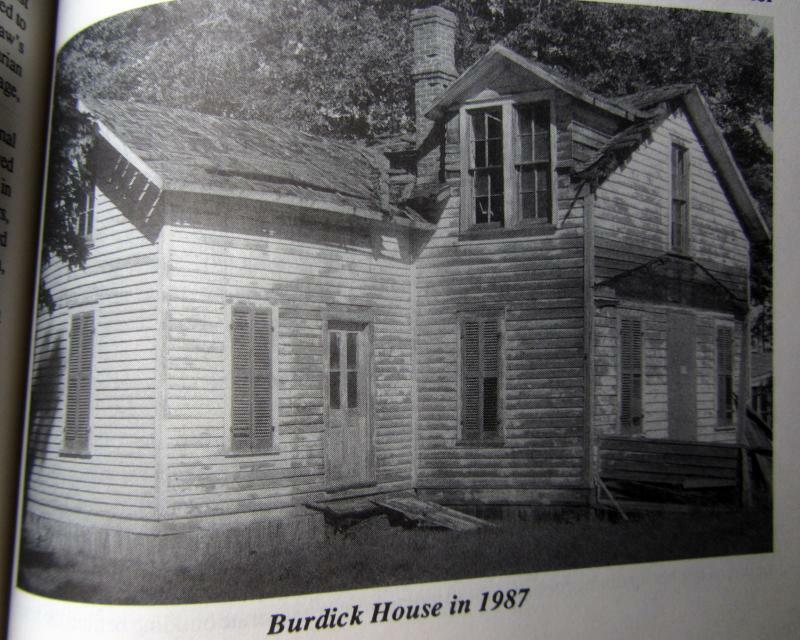 Ruchhoft says that the Burdick House, or "Tanglewood" as it was also affectionately known, actually predates Cottage Row, and according to one story was an old farmhouse. It was moved here from elsewhere on the island by Silas Boardman, to serve as a home for his recently married daughter Carrie Blossom. It was later bought by someone with the surname Burdick, which Ruchhoft notes was the same name as a family on South Manitou Island. The most popular story relating to the Burdick House is that it was designed by Frank Lloyd Wright. Ruchhoft chuckles that "at one time or another almost every house along the row has been attributed to that great American architect," but it is highly unlikely that he designed anything on the island, and "there is not a single thread of supporting evidence" that Wright was affiliated with any projects on North Manitou. My hope was to make the south end of the island with daylight left to make camp, somewhere near Bournique's homestead. The first day is always the hardest; you’re still finding your rhythm and getting yourself used to the weight of a pack again. As I kept on, I realized that the map I had been handed kinda sucked. I was not sure which trail I was on, and had somehow missed the south orchard. I also was ruing the fact that I was never able to find my actual hiking boots…I was in my work boots, which—though doing an admirable job—would not avail themselves over anything other than flat terrain. Checking my map again I realized that I had hiked over three miles without realizing it; I was already near my destination for the night, and it was not even 4pm! As a result I broke out some cherries and trail nuts when I went to shore, guzzled my water, and removed my backpack, sweat-soaked shirt, and footwear. The lake breeze was amazing. The only complaint I had is that trying to filter-draw water from a lake while waves are coming in is a hassle because it keeps sending your tube back up on shore, but I hadn't come across any creeks yet. So I waded out a bit into the icy water. As you can imagine I spent some time during this trip coming up with snide alternate versions of this slogan. I wasted a couple hours trying to find my bearings using this map. So far since I had left the “Village,” the only landmark I had actually physically located from the map was this cemetery. Several times I tried using it as a starting point to find the main trail again, or at least some other reference point, and failed every time...what the hell? I seriously considered making a direct westerly cut from the cemetery and bushwhack through the woods until I found the main trail, since that is supposedly where it lies, but the going looked pretty rough. It would be easier to backtrack to the point where I had entered the vast clearing. In the meantime I started scouting out a place to camp for the night. I was hoping for good ground, something near the lakeshore to provide a mosquito-defeating breeze, and a tree suitable for hanging my food at least six feet off the ground, below the branch, and away from the trunk. I did find this near a copse of cedars further south of the cemetery—a perfect spot. 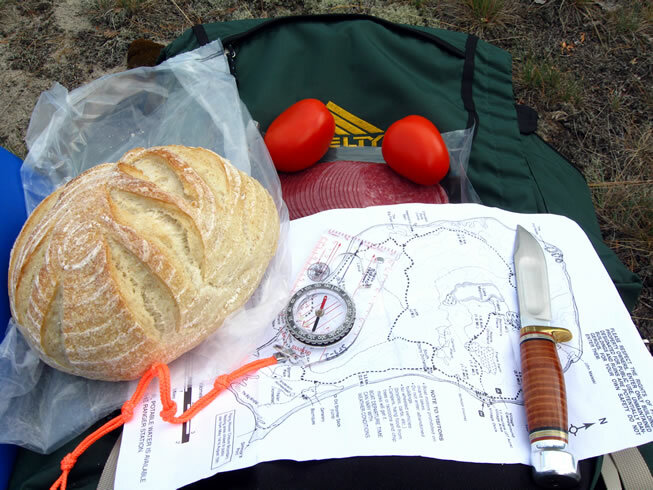 I hung my pack so that I could spend some time on foot searching for Bournique's unencumbered, yet my food would not be devoured while I was away. I started down the trail that led south out of the large clearing I had been in, back into the woods not far from where I had laid camp. I started seeing some of the endangered flowers that the ranger had told us about. Off to the left the lake was still filling the view, and the mainland could be seen at the horizon. I noticed that a large freighter was presently passing through. Suddenly without notice I saw something non-natural poking up from behind the trees—it was the roofline of Bournique's. Another clearing had opened up around me, and I knew that it must be the Bournique farm fields, though now it amounted to no more than the same lichen and juniper covered dunes that comprised the last clearing. 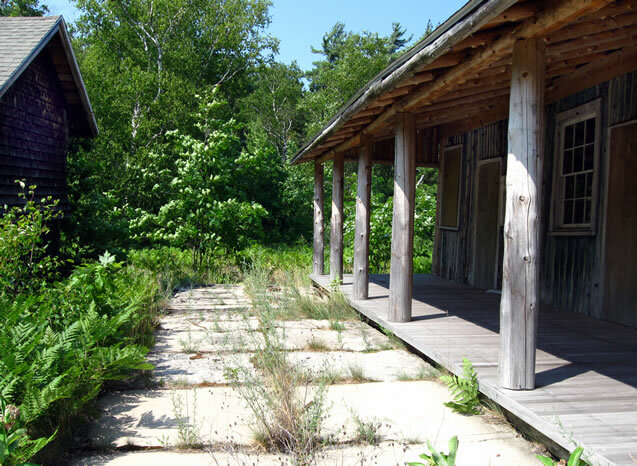 I slowly crept up the trail to the Bournique homestead in the late-afternoon heat, noting the fact that it had been repaired somewhat recently, and was well boarded up. 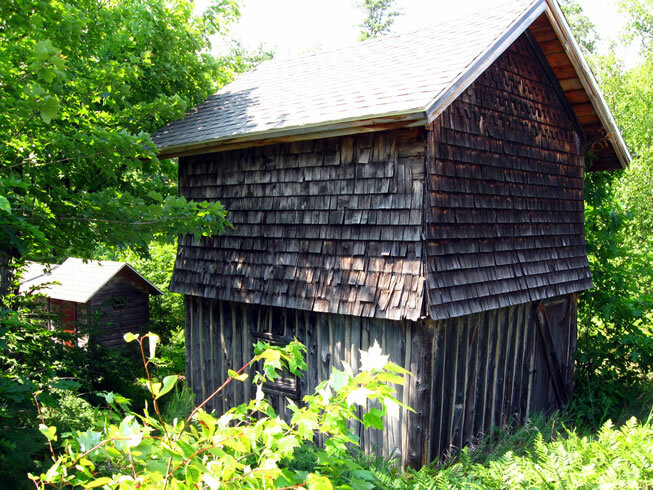 This was an old structure to be sure—it amounted to no more than a mud-grouted log cabin, though I could see where it had once been wired for electrical service; the grey, frayed cloth wires dangled from ancient ceramic insulators screwed into the handmade shake siding. This was a lonely abode. Very “wild West”…it made me think of a rancher’s homestead you’d see in a John Wayne flick or something. The plank porch clunked under my heavy booted footsteps and the bleary windows were dark—so dark that I could not even see in. 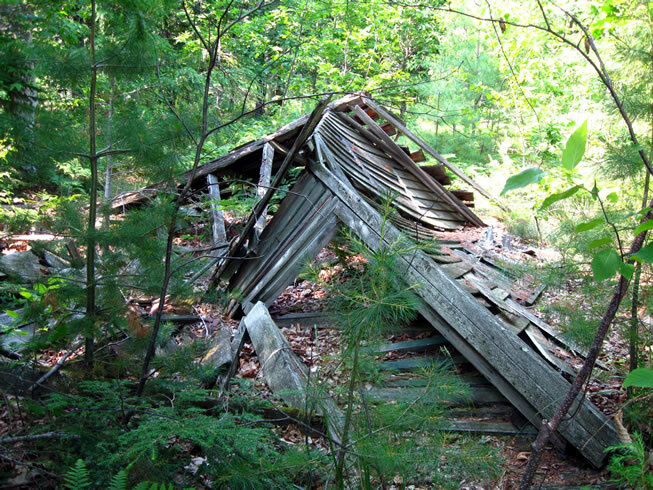 This nearby structure might belong to the Bournique homestead, or it might be the Nyrland home, I don't know. I paused on the back porch for another map check. If I had reached Bournique's this quickly, there was no reason why I should not explore further and see if I can locate the Stormer Place, which, according to the map, still stood. The Feilen and Anderson homesteads also lurked in the woods to the southwest of where I was, though the only trail going to these locales was “unmaintained.” Which basically only meant that I might have to step over some fallen logs. First though, I sat down for a serious rest. I had not slept or rested much all week, and the weather now with the warm sun and fresh lake breeze coming across the Bournique's farm was absolute balm to the sore, sweat-soaked soul. I stretched out on the dry plank porch’s shade, leaning against the boarded-up back door listening to the sound of nothing but rustling treetops, and stared off into space, thinking about nothing in particular. Visions passed lazily through my mind of back home, the trip up here, and events of the past few days. I started to zone out, slipping in and out of dreamland for an hour or two. My map marked ruins on it, but where there was only a name of the homestead shown, as with the case of the Feilens’ and Andersons’, all that likely remained was an empty field. Or at least, so said this map. Therefore it may be pointless to hazard an expedition there, but I also debated on whether to make a trip down the cape to Dimmick’s Point, where there were allegedly still trace ruins of the old c.1896 lighthouse that used to be there. Dimmick’s was also one of the sole nesting grounds of the endangered Piping Plover, a type of shore bird that lives on the island…and from hearing the ranger lady talking in the “Village,” the area was fenced off from May to August while they nest, and that there were wildlife researchers staying in the area this month to ensure successful mating. Great. Once my wistful reveries on Bournique's back porch had passed, I rose to do some more walking. After all I couldn't fall asleep yet, or I'd be up all night. From my backpack I had brought a stick of jerky, water, and my compass to guide me to the Stormer Place. Once again, as with the cemetery, it seemed that it should be simple to locate this, knowing that I was starting from an established landmark. I began to hike off on the supposed path that logic dictated ought to lead to Stormer’s. These did not mesh up with what I should be seeing, so I assumed that I must have set out on the way to Anderson’s, and that the map had lied once again about there not being any ruins at that homestead. I checked my compass against the map and as near as I could tell I was probably at or between Anderson's and Feilen's. I still to this day cannot figure out what @#$%ing homestead I was at, or where the other ones were. I have come to the conclusion that no other place in Michigan has crappier maps and info on it than North Manitou Island; every map I find is incomplete, and shows features not found on other maps, and the photos in Ruchhoft's book of—this area at least—do not seem to mesh up. So basically I have a huge mystery as to who lived exactly where, and whose house is still standing or not, between the following family names: Armstrong, Feilen, Anderson, Nyrland, and Stormer. I honestly am starting to think that no one really knows the true identity of every structure on the island, which might be why the maps are always incomplete, vague, or have at least one erroneous label. I've spotted inconsistencies in Ruchhoft's book before, so I know he isn't a completely infallible source either. The trail began to taper out and become unfollowable, so I turned back to Bournique's. It looked as though I would have to wait until tomorrow morning so I could backtrack to the main trail again in order to find Stormer's on my way out of the area. I went back and checked on my campsite before deciding to make a trek down Dimmick’s Point. I knew that it would likely be fruitless, but all the same I had to do something with the remaining hours of daylight. I was weary, but screw it; I could eat dinner when I got back. As it turns out, Alvar L. Bournique was not a farmer, nor the grizzled rancher that I had envisioned—he was a successful Chicago dancing instructor, according to Ruchhoft's book. This was his summer home, which he built here in 1903, after his brother in law had built a cottage on Cottage Row in previous years. Bournique was not interested in Cottage Row however, and continued to buy up other parcels until he eventually owned 435 acres on the island by 1920. 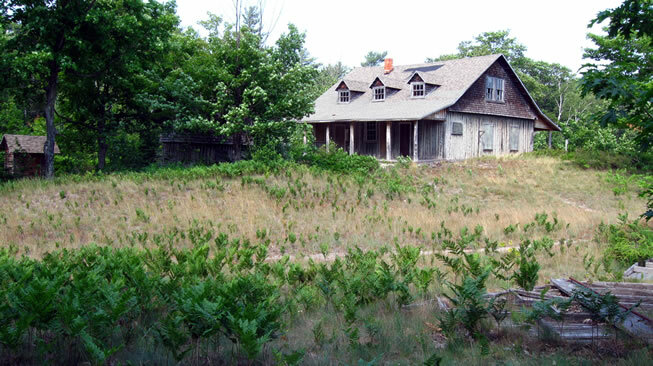 Bournique passed away in the 1930s, and his daughter sold the properties to the Manitou Island Association. It took me at least an hour, but I reached at last a crude wire barrier with a sign prohibiting me from going any further into the plover nesting area. I finally decided not to bother crossing it, since there were probably eco-warriors in the woods with binoculars watching the preserve, just waiting to pounce. Also, I'm not a total jerk. I could see no sign of anything interesting on the point in the distance anyway, so I turned around and moseyed back toward camp to eat. The reason I wanted to get down to the tip of Dimmick's Point is because there were supposedly some visible remains of the old North Manitou Island Lighthouse, though according to the Great Lakes Lighthouse Encyclopedia, “today only a few bricks remain on the shore as a reminder." By 1892, Chicago had become the fourth-busiest port in the world, and accordingly Lake Michigan was abuzz with shipping traffic serving it goods and raw materials from multitudinous points along the lakeshore and from other remoter ports. The Manitou Passage was one of the busiest—and most hazardous—shipping lanes, so by 1896 a light was commissioned to be built as well as a fog signal here at Dimmick's Point. The light was a simple wooden square tower clad in clapboard, and had an alternating red and white flash via a fourth order Fresnel and metal astragals. In 1910 the station was found to be insufficient however, and a lightship was anchored where the North Manitou Shoal Light is now. Often the lighthouse keepers—being respected citizens, and the only government officials of any kind on the island—were called upon to settle disputes between farmers. They also ran the mail from the mainland via boat, or in winter via horse-drawn sleighs across the ice. The North Manitou Lighthouse and the lightship were both decommissioned in 1935 when the North Manitou Shoal Light was activated. Its old Fresnel lens was moved to the new crib light, and the station began to decay and become threatened by erosion. By 1942 the tower toppled, and in 1968 shoreline erosion caused the front face of the keeper's house to fall off. The rest fell soon after. There were seven buildings at the Dimmick's light station, though by 1987 Ruchhoft says only the barn was still standing--albeit in shambles. You'll eventually find as I post more to this website that when backpacking I always take at least one photo of my gear and food and things spread out in some sort of display. I'm not sure why I do it, I just do. After scarfing just enough to satisfy my hunger, leaving enough for the rest of the journey, I put all smellables back up the tree and rolled out my bedding on a lichen-tufted hillock above the shoreline. The sky was clear and the air hinted of no ill tidings; I would sleep well tonight. I lay for probably another two hours before dark fell completely. Across the lake I could see a storm cell brooding over the darkened mainland, showing brown flashes of heat lightning flickering almost nonstop in silence. The breeze went still about midnight, and the mosquitoes came. I had a hell of a time fighting them off and trying to sleep. I wished the temperature would drop or something to get rid of them. The electric storm over the mainland still sparked; it was now very still and warm, and the sky had clouded up over me. I drifted in and out all night, noticing sometimes the sky had cleared to reveal a stunning carpet of stars, causing deep space to glow a dim, undefined grey beyond the arm of the sparkling Milky Way. About 3am I awoke again as the moon rose above the dunes of the mainland, blinding me so badly that I could not keep my eyes open; even its blazing white reflection on the glassy lake was too bright to look at. The lights of another ship glided silently across the water in the distance.